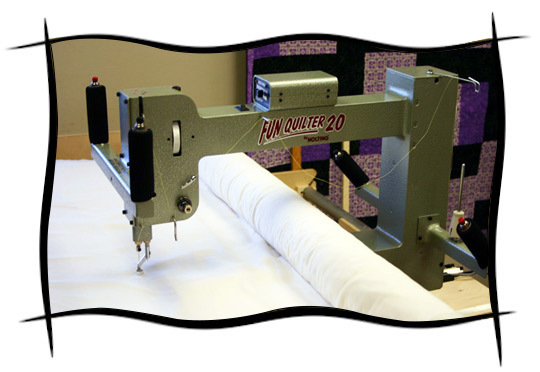 The Fun Quilter 17, 20 and 23�are three�of seven sizes of longarm quilting machines offered by Nolting Mfg. It is our latest evolution of machines made for the home user. The Fun Quilter can be purchased with or without the optional stitch regulator. It has been developed to work on nearly all the larger machine frames. This makes it easy to upgrade your system to a larger, newer or stitch regulated Fun Quilter. Of course we offer the Fun Quilter as a complete package system. A Fun Quilter on our commercial frame can easily be upgraded to our larger commercial longarm machines in the future. 17", 20" and 23" throat depth, with 8" of inside height. 4" wide x 23" or 26" long flat bottom can sit flat on your carriage. Machine, extra needles, extra bobbins, oil, light, pointer, and manual. $1,500.00 additional for the NEW Equalizer Stitch Regulator. The Equalizer features the needle up/down button standard speed control and stitch regulation. View manual online. * Machines with the optional Equalizer can work on the Nolting Commercial frame, Hinterberg Stretch frame, and Grace Pro frame. (Please call us if you have another frame.) Let us know which frame you will use when ordering.